When you meet a local in Viveiro and you tell him/her it is your first time in the area, their first question is quite likely to be: “Do you like it?”, followed by an automatic self-response: “It’s beautiful, isn’t it?”. It is a rethorical question, in their minds there is no other possible answer. Why would there be? It is beautiful. As a Viveiro native myself, I can only agree. 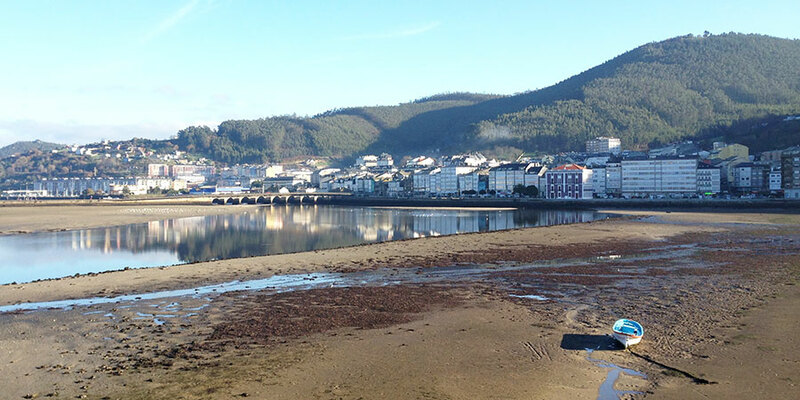 Viveiro is one of the historic towns on the Ruta do Cantabrico, a phenomenal coastal trail taking walkers through glorious paths, beaches, cliffs and coastal villages in the North of Galicia. These are the Rias Altas, the upper bays… the relatively undiscovered ‘sisters’ of the Rias Baixas of Albariño fame. 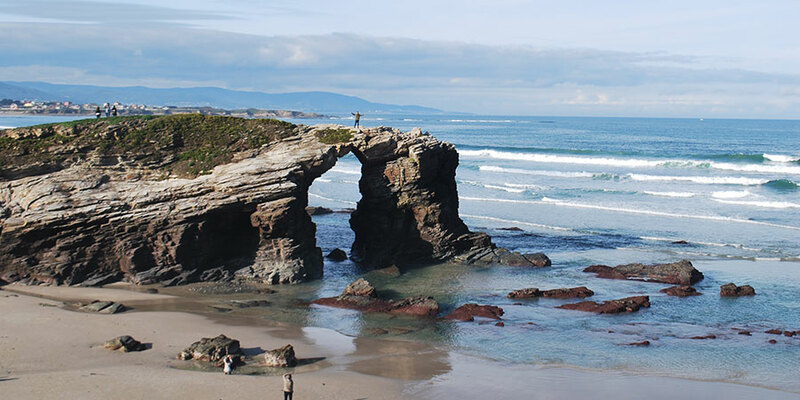 If you’d like to experience Galicia’s coast, off the beaten track, this is the trail for you. The very first reason is the fact that the trail hugs the coast of the Cantabrico Sea, all the way from Ribadeo to O Barqueiro. The scenery is simply phenomenal. You’ll start the journey in Ribadeo, overlooking its Ria (bay) and the trail will take you on coastal paths and rural lanes for over 130kms. Along this superb stretch of coast, there are many wonderful sandy beaches. The most spectacular is the beach famously known as Cathedrals Beach. Who knew cathedrals could be built by the sea? But there are many more fantastic beaches along this rugged coastline. Abrela Beach is one of my favourites and brings back many childhood memories while tiny Caolin Beach in O Vicedo will amaze you for its dazzling white colour. Area in Viveiro, Rapadoira in Foz, O Torno in San Cibrao, Arealonga in O Vicedo, A Marosa in Burela… you will see so many beautiful strands it will be difficult to pick a single favourite. Along the Ruta do Cantabrico you will stay in lively historic towns such as Ribadeo and Viveiro; as well as pretty fishing villages. This region is known as A Mariña, as it has been shaped by the sea. It is the sea that has also been the region’s traditional livelihood, and harbours such as Burela and Celeiro are still today extremely important for the local economy. 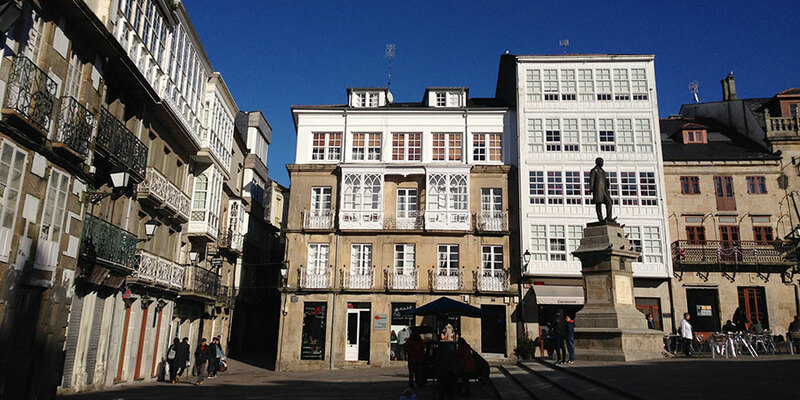 In Ribadeo, take time to admire its elegant ‘Casas de Indianos‘. These mansions were built by locals who emigrated to the Caribean and South America at the turn of the century and brought back home a characteristic and opulent colonial style which has now become part of the architectural heritage of the town. 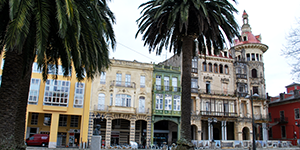 In Viveiro, stroll the old town and its animated squares, busy with shoppers and market goers in the morning and people socialising in the evenings. Spot the three remaining old wall gates, visit the impressive Romansque churches and check out the seafront with its classic white balconies, known as ‘gallerias’. Food is an integral part of Galician culture with seafood and fish being the star ingredients. 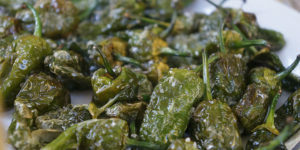 This region has many specialities particulary when it comes to products of the sea. You will be hard push to find a bar or restaurant, big or small, without fish or shellfish on the menu or daily specials. One of those specialities is fresh albacore tuna which is fished the traditional way by the fishermen based out of Burela’s port. Look out for ‘bonito de Burela’ on the menu, cooked in a rich tomato sauce or in a delicious ‘rollo’, a stewed tuna roulade. In Viveiro you should try ’empanada da feira’ (fair day pie) which is a local variety of the classic Galician empanada. 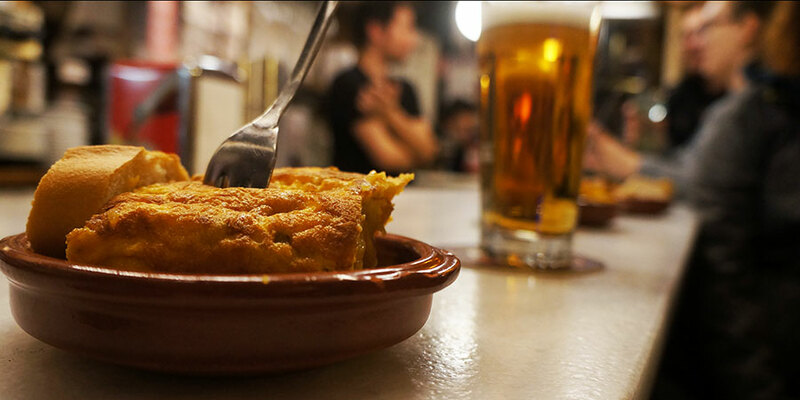 Unlike other Galician pies, this is eaten warm and it was a dish traditionally only available on market or ‘fair’ days, hence its name. This is one of my all-time favourites. 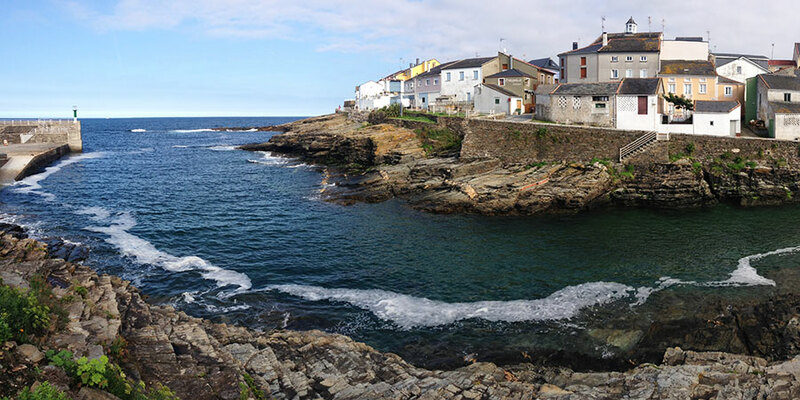 The little village of Rinlo is the place to try seafood rice or ‘arroz caldoso’ while O Barqueiro harbour is another idyllic place to have the freshest seafood. The village has been hosting an annual seafood festival for over 30 years. Good restaurants are plentiful and really affordable. While you might find dinner is served a little bit late (most restaurants start serving dinner around 9pm), you will be happy to hear many bars will serve free food, known as ‘pinchos’, with your ‘apero’ before lunch time and before dinner time (around 12pm and 7pm approximately). This means you will get to sample bites of tortilla, stew, fish pie and other hot dishes for free, nada, every time you order a drink. It’s great and is a popular past time for visitors and locals alike. Most cafes will also serve you free churros or other sweet treats with your morning coffee or hot chocolate. Each town, village and even the tiniest of places celebrates its own local festivities, mainly in the Summer months. There are many traditional family-friendly ‘festas’ as well as countless food festivals and some interesting new events in the area to keep everyone entertained. A mermaid by the name of Maruxaina is the main protagonist of the local festivities in San Cibrao, honouring the fishing community. According to local legend, Maruxaina lives in an underwater cave out to sea. Some claim she warns fishermen of the dangers of the sea and keeps them safe; while others believe she charms them causing ships to wreck. From Easter to Autumn, you will encounter an array of interesting festivals such as the Maruxaina along this route. Traditional festivals generally include a few days of music events and free food to wrap up the festivities. Sure, what other way could you possibly celebrate? Hi Aoife, thank you for your message. I will have our travel team send you prices and an itinerary for the coastal routes. There are a few different ways to choose from so they will be in touch to match you with the best trail. Kindest wishes, Lisa from CaminoWays. Prices please for coastal routes and dates.